As you can see, I got the reversal candlesticks that I had been waiting for. When I saw that a bearish candle formed after the doji, I sold the pair at market and got in at 1.2845. The trade worked well for a bit, but price soon reversed and rallied strongly due to optimism towards Greece’s debt deal. I then got stopped out at 1.2900. To be honest, I’m not too bummed on this trade. After all, even though my analysis was incorrect, I did follow my trade plan strictly! Ah well, better luck next time! 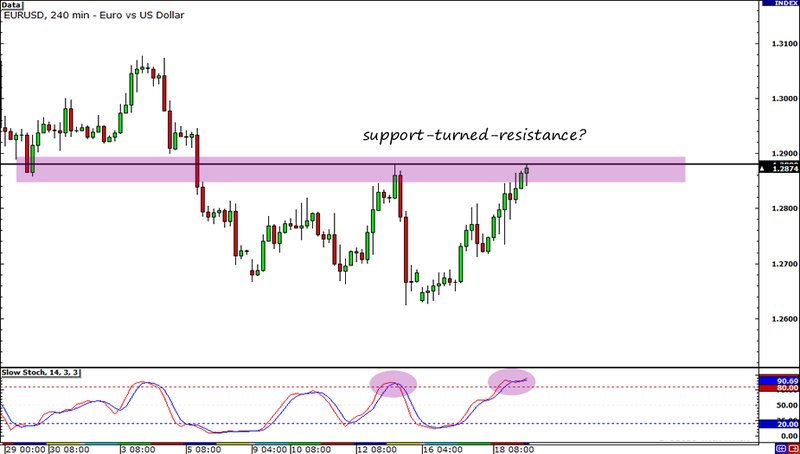 Alright folks, today, I have a “sorta” counter-trend trade idea on EUR/USD. I say “sorta” simply because while it has been trending upwards the past few days, but in the longer time frame, the pair is on a downtrend. As you can see, the pair is currently testing a broken-support-turned-resistance level. 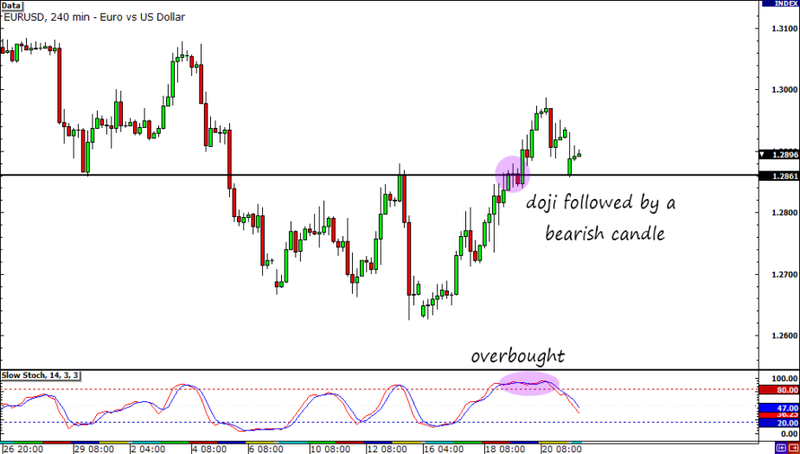 With Stochastic in overbought territory again, this usually means that going short is a good idea. However, I’ll be a little bit more cautious. I still haven’t won a trade this year, so I’ll play it safe. There’s a pretty big event risk coming up and I don’t want to get whipsawed. As you’ve probably heard by now, Greece is due to conclude its talks with private sector creditors about another debt deal. Personally, I don’t really have my hopes up for the meeting and I’m pretty bearish on the euro. Why? It’s because whether or not Greek officials get a go signal for more aid, the truth is that the sovereign crisis will still be far from over. However, like Pip Diddy, I understand that I also have to give the shared currency props for its resilience on the charts. And who knows, a positive outcome from the meeting may actually give the euro a big boost. Err, I wouldn’t want to have a short euro position open if that happens. So my plan is to wait for another confirmation in the form of a candlestick pattern. It could be any type of bearish candlestick: a shooting star, a doji, a bearish marubozu – the important thing is that it should point to a reversal. That’s it, folks! But before I end this post, let me just repeat that I HAVE NOT ENTERED YET. I WILL BE EXTREMELY CAUTIOUS GIVEN THE UPCOMING GREEK DEBT DEAL. I will wait for confirmation before jumping in. Wish me luck!